The antenna for EME on all bands from 432 MHz and up is my 5.5 m dish. Today I am QRV on 432 MHz, 1296 MHz and 5760 MHz EME and working on becoming QRV on 10368 MHz. Other bands may come in the future as the dish can give good performance also at higher bands. This dish was acquired as surplus from a antenna measurement range. 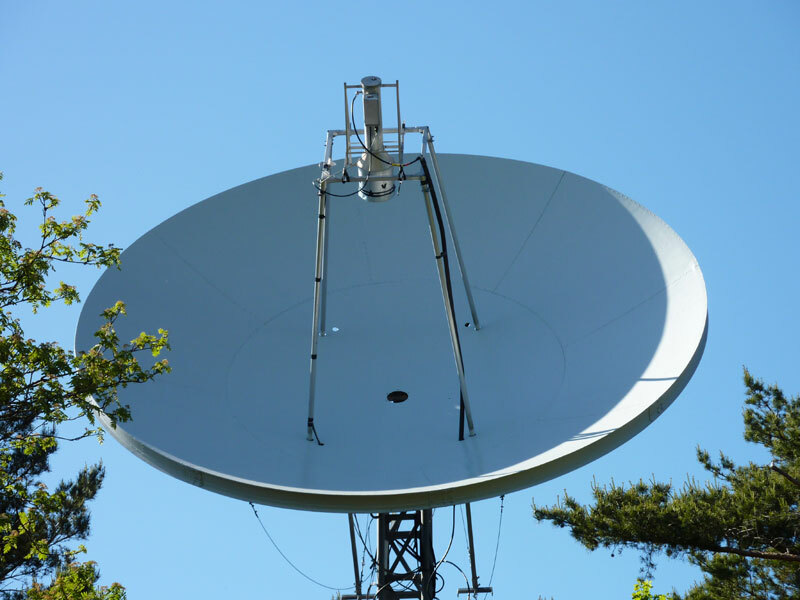 The dish was originally used as the transmitter antenna on a 1100 m long antenna measurement range from 1 GHz to 8 GHz. It was once made by NERA in Norway and has a solid aluminum surface. The support structure is also made from aluminum. I have estimated the mass to be about 500 kg. It was dismantled and transported to my QTH. The center part of the dish is about 3 m in diameter and is surrounded by 8 segments to make the total diameter 5.5 m with a f/D of 0.366. I am sure the surface accuracy is sufficient for at least 10 GHz. The azimuth axis is the center mast with a large chain drive at the bottom. The chain drive is connected to a 24 V motor via a large worm gear. The elevation axis is on top of the center mast. The drive for elevation is accomplished by a 24 V actuator. Both El and Az speeds are variable for accurate settings combined with quick movement if needed. Moon tracking is done automaticly using the OE5JFL control board. Indication for El and Az is solved with two MAB-25's feeding the OE5JFL control board. The ground noise from the horizon on 23 cm have been measured to be as shown on the picture below. The blue line show the initial profile in December 2008. The large peak from 230 degrees is a pine tree close the the antenna. The purple line show the improved profile in August 2009. The pine tree is now not in the way for the dish to the same extent. The lines show the elevation angle for 1 dB receiver noise increase when lowering the antenna in elevation. The impact on moon signals comes before this line is reached, never the less it gives a good picture of the available horizon at my QTH. The elevation angle for 1 dB increase in receiver noise is dependent on the noise temperature of the system. If the noise temperature of the receiver is decreased (=improved) the elevation angle for 1 dB noise increase will be higher as the system noise is lower at an higher elevation angle (antenna pointing into the sky) and the impact of the ground noise contribution will be higher. Moon position for -25, 0, +10 and +25 degrees of declination are also given as the brown, violet, turquoise and yellow lines. On 23 cm I can hear my own echoes from about 4 deg El at moon rise. At moon set the echoes vanish at about 18 deg of El. The dish does also work on other much lower frequencies. When I was standing on a ladder working with the feed support I suddenly heard a high pitched noise coming and going. I then realizes that the sound is dependent on the position of my head. It was the sound of the waves from the sea hitting the shore 1 km away mixed with the sound from the wind going through the trees. The dish worked at audio frequencies as well! After some trials it was quite easy to find the focal point of the dish with my ear. I could also hear birds singing far away and people talking at distance. The people must have been several hundred meters away, I have mostly forest close to my radio QTH. The audio frequency for a lambda of 23 cm in air is about 1500 Hz. The gain of the dish at and above this frequency is probably good. The absence of any bass sound can be explained with the lower gain at low audio frequencies. I was also involved in the SK6WM operation on 2304 MHz EME from Onsala Space Observatory (OSO) in October 1988. Actually both OSO and my dish are situated in the same grid, JO57XJ. I only have about 2.3 km to the 25.6 m dish of OSO. I can see the OSO 25.6 m dish as well as the radome of the 20 m mm-wave dish from the top of my tower. Just north of me is another set of dishes, still in JO57XJ. I counted to 15 dishes larger than 5 m in JO57XJ, including my dish. Gottskär, where the 6th EME conference, 1994 was held, is just 5 km from my QTH.